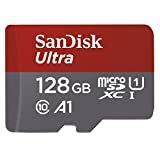 The SanDisk 128GB Ultra microSDXC UHS-I Memory Card with Adapter is the best-selling microSD card on Amazon’s entire website, and it was down to an all-time low of $19.99 all throughout Black Friday and Cyber Week. That price is phenomenal for this lightning-fast microSD card with plenty of storage space, but Amazon somehow just beat it. Order one right now and you’ll pay just $18.21, which is completely unheard of. There’s no way stock is going to last very long at this price though, so get in on the action while you still can.